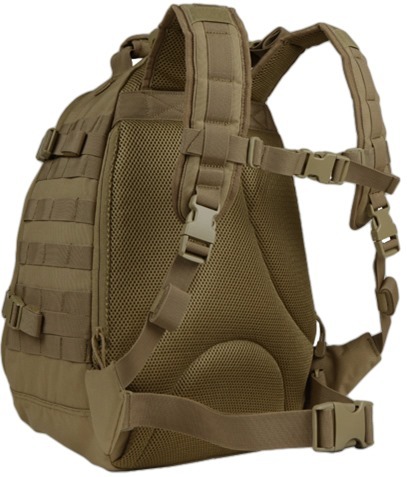 As a new month is about to begin, we are offering a 5% discount on all the items under the Tactical Gear category. The coupon will be effective from 1st October, till the 31st of October. The Gear Locker is at is again! This time we are looking at TacLace, a great product for securing your boots fast and secure. And in less time than tying your shoes. 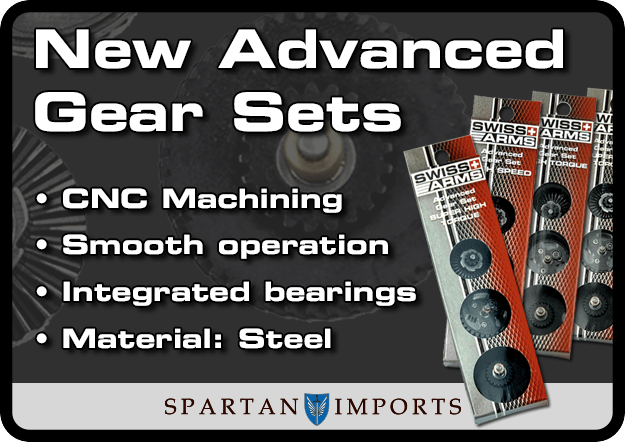 New Swiss Arms gear sets with integrated bearings for even smoother operation. Dear Customers, S&T Baby M4 AEG Series, WE SCAR-H SSR AEG(TAN), WE SCAR-H CQC AEG(TAN) and other new accessories are released.All airsoft lovers, please go to our website to check our latest product. The first shipment will arrive in October. G&P Summer Sale, All Accessories 10% OFF!! From Now TO 30-9-2013 Hong Kong Time! For Online Shop Only. $8.95 Flat Rate Shipping is back. Saturday, Sunday, Monday…. Anywhere we normally ship to, shipping will only be $8.95. Use the coupon code ‘sweet16’ in conjunction with the flat rate shipping to save even more money! The Ver. 11 Mini Battle Star Mystery Box is still available. We have a small quantity remaining. Featured in this mystery box is the KWA Magpul RM4 ERG Airsoft Gun. Use the coupon code ‘sweet16’ to save 16% on your next mystery box order. Hey Airsofters, If you’re looking for tactical pants, you know the cost can be a tough part of the deal. Dropping $50 or more on pants can hurt the wallet of any of us. For a less-expensive but comfortable option, check out a review of these Rothco Tactical Operator BDU Pants. 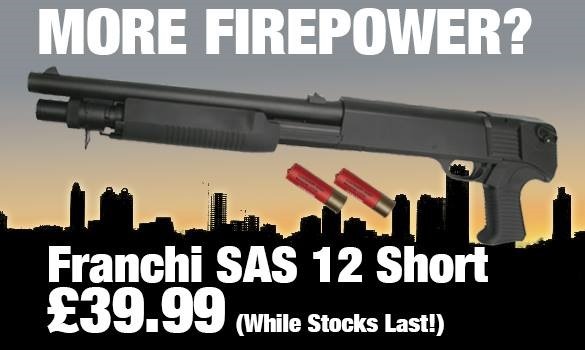 Hi Guys, We’ve currently got an offer on the ASG SAS12 Short Shotgun. Only Limited 200pcs. Don’t lose this valued chance if you are the machine gun collector. 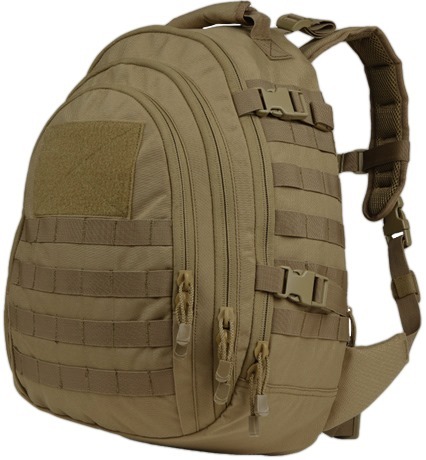 Airsoft GI – $8.95 Flat Rate Shipping This Weekend! Sat. 9/28 – Mon. 9/30. Don’t miss out! This weekend, AirsoftGI is offering $8.95 flat rate shipping for three days! That is right! Three days of flat rate shipping to anywhere. Alaska, Hawaii, Canada. Be sure to take advantage before it is over! In this New Products September (Part I), we have a lot of new products from G&P, ARES and RWA. 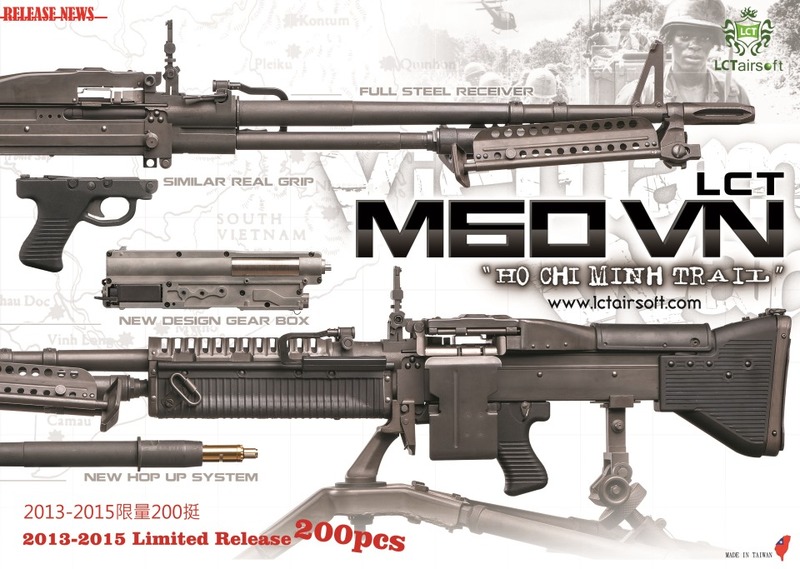 Such as M870 shotguns, M14 DMR sniper rifles, M4A1, M4 CQB, M4 CQC, SR25 Sass and Carbine. See what Tim has to say about them! This Kydex Holster was made for my Airsoft Pistol, but it works so well with my Real Steel M&P that it has been my go to Holster for IDPA shooting so far. Build quality is outstanding, all edges have been smoothed and the guns fit great. Both platforms (Airsoft and real) snap into place with great feedback, and the retention is perfect. No adjustment was needed on my part, but results may vary. This particular Holster is in Multicam, but they carry a broad color selection, and a few different camo options as well. Turn around time was outstanding, my item arrived a week after the order. I am sure this is determined by amount on hand, and if there are special request with your order. Many thanks to LPE http://www.leesprecision.co.uk/ for providing excellent service and getting the suppressor to me so fast. A mere 2 days from placing my order it was on my rifle. Their website is top notch, and the product quality is outstanding. I highly recommend them. DO NOT ATTEMPT THIS AT HOME!!! Matt Davis has not self-demo’d one of Armor Express’ ballistic solutions since 2008. This is his 4th demo, but the first with a .45ACP, and the first with their IIIa ballistic package [which is what US Palm runs exclusively]. Airsoft GI – MK16 SCAR Airsoft Loadout: Tactical Gear Heads with Bob "The Axe Man"
For players looking to get started, breaking into the airsoft world is sometimes intimidating. Deciding on how to build a loadout from the seemingly endless amount of choices may not be easy. However, in this episode of Tactical Gear Heads, Bob puts together some guns and gear that can help the introductory player get started at an affordable price. With Gryffon Gear and the Classic Army MK16 SCAR Sportline, the new player will be fully equipped for whatever the battlefield throws at them. Be sure to check out the product links below if you are interested in them! S.H.A. Update – New Products, Coupon Codes, Apparel? Just a very quick update about Spotted Hog Airsoft, Angus’ online airsoft store. Just letting you guys know about some new products on the site, some available coupon codes, and I also wanted to present the idea of Spotted Hog Airsoft apparel. Thanks for watching! Short demo video primarily of Blowback Armory Custom M4 rifles. YouTube video maker in Scotland, over 130 MILLION hits. Just a video that May be helpful to you Airsofters out there.. Check out his FB page and tell him Shwell sent ya! Airsoft GI – OCT. 12th! 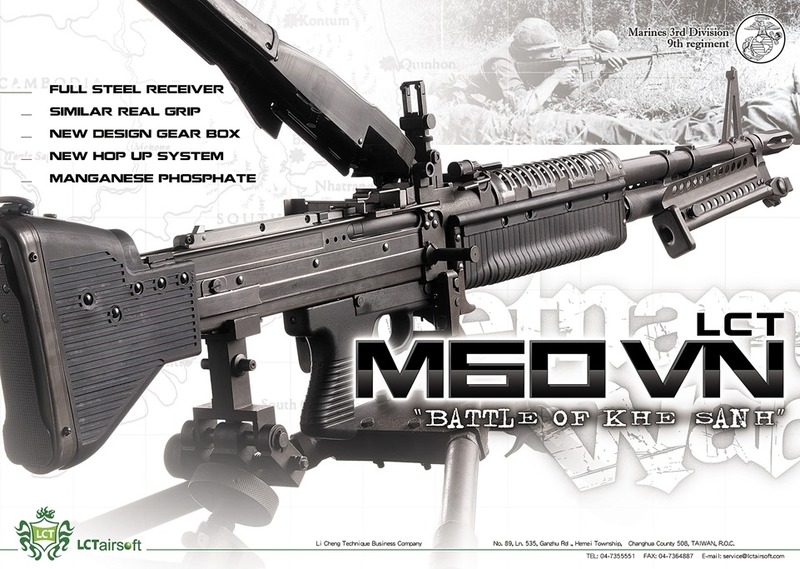 Airsoft GI West Coast Sale with Echo 1! 11am – 7pm. Be There! On October 12th, be sure not to miss out on our West Coast Walk-in store sale in coordination with Echo 1. They are going to be bringing out some awesome guns, and we are going to be offering 20% off our in store items. Plus, there will be a raffle and goodie bags so be sure not to miss out! This is a preview of my current work on the SOLN1. Slow Motion and quick overview of the KP-06 Hi capa. Hell of a pistol, I recommend these handguns entirely, they are very loud, accurate, and powerful. Not to mention the mag capacity is fantastic, they also handle the cold well on Co2. Mine has a polished slide. The fiber optic sights are standard. NOTE: I have the commercial rights to all the music in this video. Music by Johobo2 on Newgrounds. UMAREX Legends is a brand new series in the coolest classic weapons as we all know from the movies, they are done in a very nice and solid quality. Luger P08 or Parabellum pistol is a semi-automatic self-loading pistol introduced by Deutsche Waffen-und Munitions factory in the 1890s. It was used by the German army in the early 20th century and adopted into the German Army in 1908 hence the 08 in the name. The basic design of the gun and its variants are known by several different military names such as Luger P08 and Ordonnanzpistole 00. Best known is the Luger P08, however, to be an officer’s weapon in the German Wehrmacht during the second World War. This gun is an all-metal construction with authentic wing safety, including removable metal magazine. Madbull brings yet another unique product to the airsoft world. This Stark SE5 Express grip is specifically designed for shooters who train and operate with the support hand well forward on the hand guard, fore-end or rails. Squared up, elbows in, thumbs forward driving the gun toward the threat for increased accuracy during dynamic situations. The Express Grip allows the users forearm and hand to remain in a more natural position. This angled grip is comfortable – in stark contrast to other vertical fore grips – comfortable enough to hold in position during long wait periods, especially in a dynamic threat situations. When it comes to bringing the best to airsoft, Madbull is in a class by itself. – Unique angle design for comfortable grip.